December was very similar to my November condo/townhouse market report. Sales fell again this month, however, new listings fell even faster. After enormous price gains this year sellers are hesitant to sell in lieu of recent equity gains. However, the stats don’t paint the whole picture. Despite record low inventory levels, and sales outpacing new listings there is no upward pressure on prices. In fact, prices for much of the attached market have actually come down a bit. This is contrary to the demand/supply theory that suggests more demand than supply should push prices up. As per the chart, REBGV condo sales are down 25% year over year. 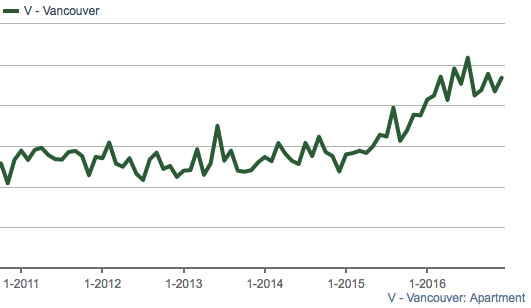 FVREB (Fraser Valley) condo sales are up 4% year over year. You may wonder why the discrepancy between the two areas? The Fraser Valley took off about 4-5 months after Greater Vancouver and still remains affordable, a delay should be expected during a correction phase as well. New condo listings for REBGV were down 35% year over year, FVREB was down 19%. 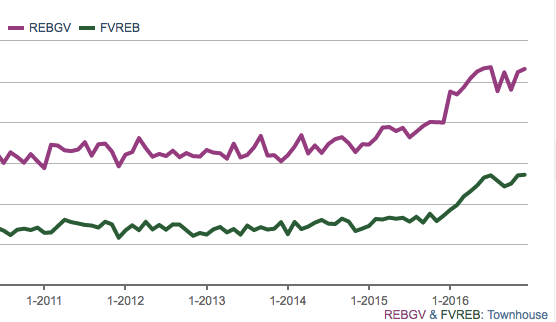 It was the fewest number of new listings for REBGV since December 2012. Inventory levels for December 2016 have not been this low over the past 10 years. 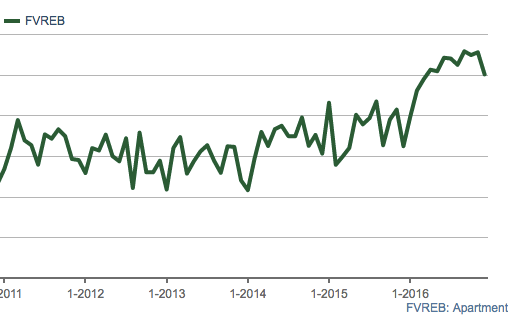 Months of inventory also highlights the abnormally low levels of inventory. All indicative of a sellers market. Condo prices depend on each area. In most areas prices are down about 5%, however prices are still climbing in some areas such as Richmond. I have highlighted a few graphs below to show the volatility. Below is the average sale price of Greater Vancouver, Fraser Valley, and Vancouver condos. Sellers still have the upper hand in the condo market. This is most evident in the sales/actives ratio or the extremely low inventory levels. However, much of the low inventory levels are a result of the completely overheated demand levels that absorbed all the inventory in the spring and summer. It appears it will take some time for inventory to creep back up. Make no mistake, a 25% correction in REBGV sales is significant and could be telling of where the market is heading. However, with recent government intervention promoting first time buyer loans it’s hard to say for sure what happens next. One things for sure, more inventory is on the way as we head into the spring market. Don’t expect much change until then. 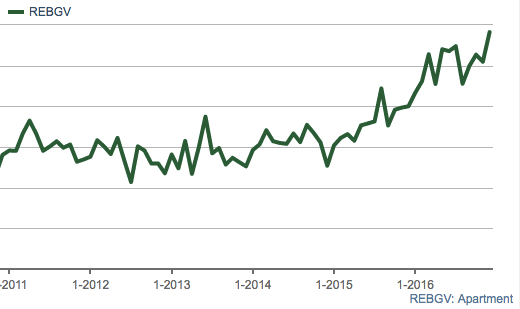 Similar to the condo market, sales outpaced new listings in the month of December. This is quite standard as sellers opt to wait until after the holidays. Much like the November Condo/Townhouse Market report that I published, townhouse sales in December fell significantly year over year. For Greater Vancouver they are down 40%, Fraser Valley 23%. More importantly, REBGV townhouse sales were 14% below the 10 year average. New listings in Greater Vancouver (REBGV) dropped by 25% year over year, FVREB new listings dropped by 39% compared to December 2015. All markets are indicative of a sellers market. Again, this is due to low inventory levels and not a surge of sales. All markets also indicate a sellers market. Anything under 4 months is considered a sellers market. Townhouse inventory remains at 10 year lows. Townhouse prices again defer in each area. Average and median won’t show you much on the charts at this point. However, most comparable properties appear to be selling about 5-7% below the peak in Greater Vancouver. This is most notable in the higher end townhouses, such as Vancouver West. As detached house prices continue to drop, high end townhouses appear less favourable. The MLS benchmark for all areas is trending downwards, however the movement is very minimal at this point. Here’s how the average sales price looks graphed out for REBGV and FVREB. The townhouse market has taken a substantial hit in the total sales department. Much like the condo market prices are remaining relatively stable as low inventory keeps buyers competing for the few product available. This could and will likely change as more listings hit the market in January. The sales/actives ratio and months of inventory levels may seem daunting for buyers but again this is more a reflection of record low inventory than euphoric levels of demand. There is some wiggle room on price for most townhouses.